I’ve got a new post up at a new site, Evonomics Magazine (“The next evolution of economics”). It’s an impressive offshoot with some great articles, assembled by folks involved with The Evolution Institute, which I’m a big booster for. My readers here will find much familiar in the post, but I’m happy with how it pulls various threads together. I’ll be following comments over there, so have your way with it. While interesting, your article has a few flaws. First, “sharing” is voluntary on the giver’s part. Wealth redistribution by the government does not fit that definition. 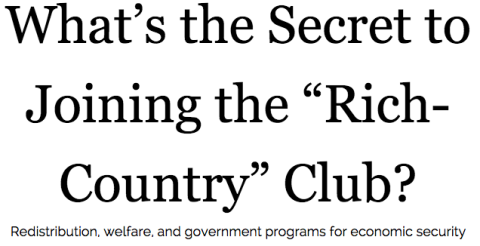 Second, countries tend to get into the Rich-Country Club first, then start the redistribution programs. How’s that redistribution working for Venezuela? For Zimbabwe? Has ANY country pulled itself into the Rich-Country Club by increasing it’s government spending? Which is cause, and which is effect? Third is the contention that the rich do not spend their income. I disagree. They just tend to buy assets, not consumables. But even there, we confuse cause and effect. Most wealth is accumulated by buying assets instead of consumables. It is not that the wealthy tend to buy assets with their extra income, rather than consumables, but that those who spend their extra income (those who cut back on their consumables so that there IS some extra income) buying assets become rich. All of which leaves the question unanswered: why hasn’t a libertarian state emerged, surged, thrived, and outcompeted all the rich countries? Not even once. How could such a state emerge? Would any majority vote for it? If a majority doesn’t see the “benefits” of libertarianism why should anyone support the ideology. Maybe those supposed benefits are not real or tangible enough to sway the support of that majority. And who would wan to live under a minority supported system of government or economics? Perhaps I misunderstand you, Jack. You only support whatever ideology the majority supports? Very nice job , Steve. Adding Evonomics to my list…..
No, because teenage boys aren’t allowed to vote anywhere they allow democracy, and teenage boys never control dictatorships. 2. “I’ll cut your taxes” is the world’s oldest and most effective vote-getting pander. If the supposedly inevitable freedom and thriving prosperity ensued, breaking out all over, why wouldn’t they vote for it? That should make a great slogan. Good luck with it really. Posting it at AB also? No, “I’ll take from the rich and give to you” wins that contest.